serigraphs by Michael Guerriero "High Water." serigraphs by Michael Guerriero "West of Yachats"
Even if you've never laid eyes on one of Michael Guerriero's distinctive serigraphs, you have likely seen one of the first works he created after moving here in 1977. Fresh out of grad school in Kalamazoo, Mich., Guerriero put his graphic design skills to use offering sign-painting services to Old Town businesses. Up against other newcomers like Duane Flatmo, Guerriero convinced several shops to take his offer. Jim Dunn's Cosmopolitan, a faded gray sign for a historic watering hole, is the only remaining venture from those days, and it's great fun to look back 36 years and witness the early efforts of one of Humboldt County's premier serigraphers. An affable, tall man with silver splinters in his short-cropped, curly hair, Michael Guerriero has a quick laugh and a radiant smile. He has served as a member of the Bridgeville School Board and conducted art workshops with local kids about the Eel River salmon run ("Salmon Celebration," April 5, 2012). Guerriero also represented Humboldt County for a decade by designing and building the county's State Fair exhibits. With the help of many, including Mark McCullough (Mr. Fish), Libby Maynard, Jim McVicker, Stock Schlueter and Eric Hollenbeck (from Blue Ox Millworks) the exhibits won two Best of Show titles along with a plethora of other accolades ("Putting a Face on Humboldt," August, 1997). Of course, Guerriero is probably best known for his luscious landscapes. An early visit to screen printer John Wesa's studio gave him the courage to jump into screen printing, something that he'd been interested in since high school. Guerriero built himself a home studio, a press and some frames, and got down to some serious serigraphy. So what's the difference between screen printing, silk screening and serigraphy? Essentially nothing. They all involve the construction of an image by pressing ink through a screen onto a substrate, usually a piece of paper or fabric. The process originated in China a thousand years ago, but now that most screens are polyester instead of silk, the most commonly used terms are screen printing and serigraphy. The term serigraphy was coined in the early 20th century as a way for artists to distinguish their work from the onslaught of mass-produced screen printed goods that were just becoming available. While a commercial screen printer will cut corners to keep costs down, a serigrapher uses all the tricks of the trade to produce a refined aesthetic. It might not be the most efficient way of working, Guerriero says with a laugh, but the results are worth it. Guerriero usually begins with a photograph that balances larger abstract shapes and realistic natural elements. Then using Photoshop he creates a "cartoon," or a filtered rendition of the photo somewhat akin to a black and white line drawing. This goes below a layer of glass, on top of which he begins painting a series of screens. Each screen is like a stencil, blocking off some areas of the print while allowing other areas to receive the ink. Working from a few dozen containers of variously hued yellows, blues and reds, Guerriero mixes the background colors first. These tones are pulled from his initial photograph, but as the print advances the photo becomes irrelevant as Guerriero blends custom colors to harmonize into a final print. For many of the works as many as 15 stencils, or frames, are used to layer color after color on top of one another. During the prints' progression, the stencils get smaller and smaller to lend increasingly detailed features to the more expansive layers of color below. Viewers who look closely at each print will notice lingering details, sometimes just a watery glint or an angled shaft of ashen rain that indicates how carefully Guerriero has planned out his prints. Each of these works embodies a calculated process from start to finish. These are not paintings that take on a life of their own as they are painted, but rather a meticulous journey through successive layers of color. Indeed, Guerriero hopes his viewers will "look beyond the landscape they are seeing [for] the brush marks, the hand that is applied and the way the overlapping aspects of the print interact." With that in mind, these serigraphs truly are "more than just an attempt to represent the landscape." A close examination of the prints highlights the intricate layers that comprise each print, but pull back a few steps and the composition reveals the worldly, observant sense of design Guerriero possesses. Like many other serigraph artists, Guerriero harnesses the power of strong graphic elements in order to make the most of his medium. Rocks rise up like monoliths, watersheds recede, beaches swoon and clouds reveal the sky's majesty. One print, titled "West of Yachats," offers dark lavenders, seaweed greens, and rough aquamarines drifting below milky salmons, faded oranges and husky yellows. Some of the shapes are sharp with pin-point details. Others have edges bleeding delicately into receding layers. The soft, dappled effects of Guerriero's color combinations seem to erase the stencil edges, bordering on a watercolor effect. Michael Guerriero moves to Yachats, Oregon this month. In his new seaside village he has bought a few parcels to live in and build on with the assistance of his architect son. 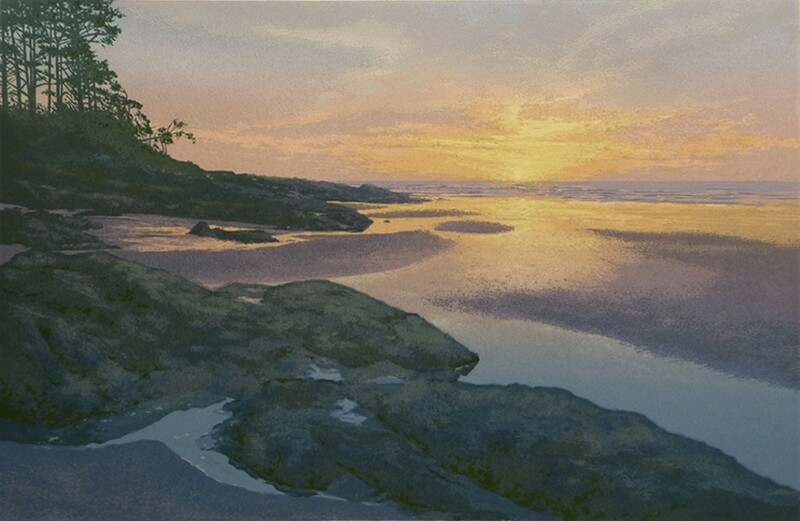 Along with furthering his portfolio with new images of the Oregon coast, Guerriero also plans to continue his recent foray into acrylic painting. A reception for his show "Farewell" will be held at the Sewell Gallery Fine Arts from 6-9pm on July 6 for Arts! Alive. The Sewell features only Humboldt County artists, so this may be your last chance to see a comprehensive local show of his work. Ken Weiderman also encourages print-making enthusiasts to visit Drrrrty,a show by the Giant Squid Printmakers Collective at Ink People's Brenda Tuxford gallery during Saturday's Arts! Alive.